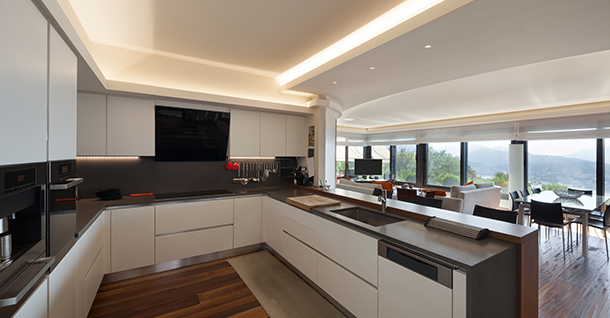 So, now that spring is finally here, and you can keep the windows open for longer than twenty seconds without freezing to death, it’s time to start that kitchen remodel you’ve wanted to do since you moved in. However, you’re a smart home-owner. You don’t want to sink a bunch of money into it that you’re not going to get back. Not only do you want a nicer kitchen, you want to make it work for you. It’s tough to know where to begin. Do you replace the stove? The cabinets? What’s going to get you the best return on your investment? We’ve got the top 2018 Kitchen Renovations That Yield the Best ROI. Painting is one of the easiest ways to add value to any room in your house. However, it can be a bit tricky to find the best return on the (relatively small) investment. For one, if you plan to live in the house for several years before selling, you’ll probably have to paint it again before you do. This is especially true for the kitchen, where you’ll have to cover fading and stains before you put it on the market to get the best price. Additionally, which color to pick can be a bit difficult as well. The colors that are most popular tend to come and go with the times. For instance, one of the most popular colors right now is one called Stonington Gray — though that can vary by region and time. The popularity comes and goes with the fads. If you’re going to live in the house for a while, pick the color you want, and repaint before you sell. If you’re getting ready to sell the house, go to your local paint shop and ask them what the most popular color for selling a house is, they should be able to direct you. Homebuyers are really into the open floor plan these days. If you’re going to get into serious remodeling, look for walls that can be knocked down or opened up. You’ll want to talk to an architect or builder before you commit to this, because you need to be wary of supporting walls. However, once you’ve identified them, it’s pretty much free game. Even if there’s just a small wall between the kitchen and living room, knock that sucker down and open up the doorway. One popular option is knocking down half a wall to form a counter between two rooms. This adds the feeling of opening up the floorplan, while allowing you to hold onto that precious cabinet-space. If this is the route you decide to take, know the renovation can get messy. You may also need to hire someone to pick up the construction debris if you decide to tackle it on your own. If the only option for you is a supporting wall, that can be dealt with as well. It’s a bit more trouble, but there are ways around it. Talk to your builder or architect about the viability of placing a supporting beam across the ceiling where the wall was. This can displace the weight the wall is holding and allow you to take out the wall itself. Opening up space like this is a bit costlier, but it can really yield a great ROI on your home. One thing that can really place your home above and beyond your neighbors (and better yet, the rest of the market) is professionally done stonework. The detail and care that comes across with well-done stonework appeals to a lot of home-buyers. Granite countertops, for instance, appeal to homebuyers no matter what the price range. You don’t have to go with the most expensive slab you can find, but anything is better than the old laminated plywood countertops. On top of that, a real stone backsplash around the stovetop and sink is very popular among homebuyers. Not only does it look fantastic, but it’s much easier to clean than plain wall. Pick a neutral, simple tile to put up, and match the grout to whatever kind of countertop you have. If your kitchen floor is the old, vinyl tile, rip that up and put down a simple stone tile to match the countertops and backsplash. This will make a huge difference in the value — real and perceived of your house. These are some of the simplest 2018 Kitchen Renovations That Yield the Best ROI that will provide the best return. Not only are all these changes hugely popular at the moment, but they make a huge difference to the way your kitchen and house presents itself. While all of this is somewhat based on trends and fads, they all also allow incoming homebuyers to see the potential of the house. Since your kitchen is one of the most lived-in rooms in the house, improving it can make a huge difference in the impression your house makes as a whole.